Neural wrinkles: The characteristic pattern of folds in the brain’s outer shell, or cerebral cortex, is established before birth. A brain region involved in reading faces shows fewer folds in toddler boys with autism than it does in controls. As they age, these boys may acquire additional convolutions in regions involved in understanding others’ thoughts. Researchers presented the unpublished results today at the 2016 International Meeting for Autism Research in Baltimore. These structural differences may relate to social difficulties in the children, says Lauren Libero, a postdoctoral fellow in David Amaral’s lab at the MIND Institute of the University of California, Davis, who presented the findings. 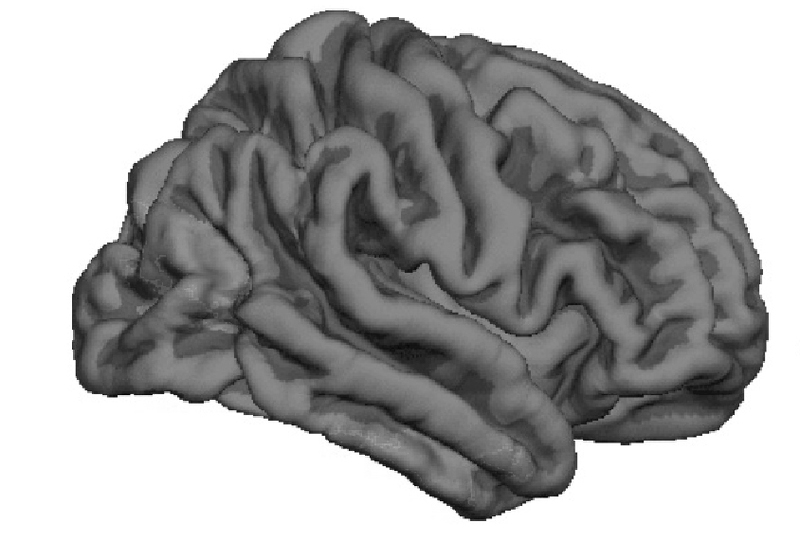 Studies of postmortem brains from the general population suggest that the characteristic pattern of folds in the brain’s outer shell, or cerebral cortex, is established before birth and changes little throughout life1. In the new study, the researchers used structural magnetic resonance imaging to scan the brains of 105 boys with autism and 48 typically developing boys when the children were 24 to 42 months old. The groups of children were no different in physical characteristics at birth or in age. The children with autism have lower scores on intelligence tests than the controls do, however, and 19 of them have unusually large brains for their height. The researchers found that the boys with autism whose brains are of average size show less folding in the fusiform gyrus than do those of controls. The fusiform gyrus is involved in recognizing and reading faces. When the researchers focused only on the boys with enlarged brains, they saw a different pattern: increased folding in both the cingulate cortex, which is concerned with decision-making, and part of the superior frontal cortex, which governs higher-order cognitive functions such as self-awareness. “It’s interesting to note that the boys who have brain enlargement have a very different pattern of cortical folding, so they’re sort of a different neurophenotype than the other boys,” Libero says. When the participants were 5 years old, 55 of those with autism and 29 controls returned for a second brain scan, allowing the researchers to track brain folding with age. As expected, the folding patterns of the typically developing boys did not change with age. What’s more, the reduced folding in the fusiform gyrus in the autism group was still evident, suggesting that this alteration is stable. But some folding patterns in the 5-year-olds with autism differed from those seen earlier. The cortex was more convoluted in three regions, including the right temporoparietal junction, which is involved in understanding others’ thoughts, a skill called theory of mind that is deficient in some people with autism. Differences in brain structure in this area may contribute to difficulties with theory of mind. It’s not clear why these new folding patterns emerge at age 5 in the boys with autism. Libero says they might reflect altered brain development, response to behavioral therapy or compensation for other problems in the boys’ brains.